Winners in each category receive a cash prize of $2,000, to be awarded at a reception on October 13, 2018, during the ScienceWriters2018 meeting in Washington, DC. NASW currently awards prizes in seven categories: Books, Science Reporting – Short, Science Reporting – Medium, Science Reporting – Long, Science Reporting – Series, Science Reporting for a Local or Regional Market, and Commentary and Opinion. Big Chicken dives deep into the world of modern agriculture by way of chicken: from the farm where it's raised directly to your dinner table. Consumed more than any other meat in the United States, chicken is emblematic of today's mass food-processing practices and their profound influence on our lives and health. Tracing its meteoric rise from scarce treat to ubiquitous global commodity, McKenna reveals the astounding role of antibiotics in industrial farming, documenting how and why "wonder drugs" revolutionized the way the world eats–and not necessarily for the better. The judges write: Big Chicken is a meticulously researched and beautifully written volume. McKenna provides context for the current antibiotic resistance disaster and retraces its roots with a fascinating historical narrative. Through her colorful and responsible reporting, we meet farmers coping with relentless economic pressures to use antibiotics, while others have found sustainable ways to raise chickens that consumers–and some corporations–are now supporting. It's a compelling tale by one of our finest public health journalists." "The Mystery of the Wasting House-Cats" was published in The New York Times Magazine on May 16, 2017. It links an epidemic of hyperthyroidism in cats to flame retardants widely present in most homes and explores the question of what these chemicals might be doing to our own bodies. The judges write: "Here's a cat story on the Internet worth reading. This is a delightful look into the lives of hyperthyroid cats and the deeply curious veterinarians caring for them. Anthes writes so well and so succinctly, showing how this increasingly common condition may arise from abundant flame retardants in our homes. It's a novel way to explore the potential human health impacts of PBDEs: an epidemiological investigation across two species, described clearly and with irresistible detail." "Accidental Therapists: For Insect Detectives, the Trickiest Cases Involve the Bugs That Aren't Really There" was published in STAT on March 22, 2017. The story explores a mysterious phenomenon lurking at the intersection of entomology and psychology. The judges write: "Cases of delusional parasitosis are curiously on the rise. Boodman spins a surprising tale about people suffering from this special kind of torment with sensitivity and flair. His vivid prose and sympathetic treatment of the subject–told through the eyes of an entomologist whom the afflicted call upon for help–make for a gripping read. He has crafted a masterful profile of a Ph.D. scientist committed to gaining their trust and guiding them toward understanding their delusion in ways that medical doctors cannot." "The Detective of Northern Oddities" was published on January 4, 2017, in Outside. It presents readers with an unforgettable portrait of an Alaskan veterinary pathologist at work. The judges commend it as "a phenomenal piece." They write: "Solomon finds fresh angles to talk about how climate change in the high Arctic might drive the spread of new contagions through animals in Alaska and beyond. He vividly evokes the sights, sounds, and smells of his subjects, both in the field and during necropsies in the lab. The story delves into some intense science without tripping up the reader. It's a flawless narrative, rich with wonderfully atmospheric writing and a memorable protagonist." "United States of Climate Change" was published by The Weather Channel Digital between April and December 2017. It zeroes in on the tolls of climate change, state by state. "This downright addictive series enables readers to click on any state to see the impact of climate change on their lives," the judges write. "It does so not through cold scientific facts, but with skillful storytelling that makes this global crisis truly personal. The climate is a character in each piece in this ambitious and innovative project that tackles the greatest challenge of our time. The stories provide a crystal ball to show a wide-ranging audience what the future may hold. If that doesn't incite us to action, nothing will." "Doomed by Delay" was published in the Chicago Tribune on October 8, 2017. The story offers a devastating account of one little boy's life with a progressive disease that could well have been averted. The judges write: "This is old-school investigative journalism that holds government to account for policies that are literally killing people. Callahan has produced a compulsively readable piece about an arcane disease that shows the emotional toll of ongoing bureaucratic ineptitude. We won't soon forget the time we spent with this mother and her son, and her fight to prevent the same tragedy from striking more families. Impressive on so many levels, this moving project showcases the power of in-depth reporting at metropolitan newspapers." No award was made in the Commentary and Opinion category this year. The final judging committee consisted of Rob Irion (freelance), Liza Gross (freelance) and Jennifer Ouellette (freelance). 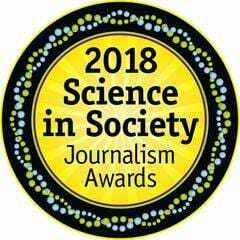 The Science in Society awards committee was co-chaired by Alla Katsnelson (freelance) and Jyoti Madhusoodanan (freelance). In addition to the final committee, NASW thanks the volunteers who served on the preliminary committees: Eric Bender (freelance), Emily Monosson (Ronin Institute), David Wolman (freelance), Steve Maran (AAS), Antonia Malchik (freelance), Sarah Everts (Carleton University), Judy Foreman (freelance), Corie Lok (Xconomy), Robin Meadows (freelance), Chris Gorski (Inside Science), Rebecca Guenard (freelance), John Roche (Science View Productions), Cori Vanchieri (Science News), Esther Landhuis (freelance), Sarah Witman (freelance), Peter Friederici (Northern Arizona University), Pamela Worth (Union of Concerned Scientists), Amy Nordrum (IEEE), David Biello (TED), Bill Schulz (freelance), Heather Goldstone (WCAI), Whitney McKnight (freelance), Silke Schmidt (University of Wisconsin-Madison), Jenny Morber (freelance), Bill Funk (freelance), and Shannon Shea (US Dept. of Energy). Entries for next year's competition, for material published or broadcast in 2018, are due February 1, 2019. Entry forms will be available at http://www.nasw.org/scienceinsociety in December 2018.